This trip follows a scenic but rarely travelled route through a series of lakes and streams with high rocky shores. Allow five days. On the middle section (Kliman – Stauffer Lakes) you are unlikely to see other people. References to “Ric’s Route #__ “ are references to the maps of the area that Ric from Churchill River Canoe Outfitters has had made up. He has specialized maps of many areas in northern Saskatchewan. Start: At Bear’s Camp on MacLennan Lake on Highway 905. You can leave your vehicle there. We paddled south on MacLennan Lake toward a 250 metre portage that we had previously used to get to Davis Lake. On the way, since the water was very high, we chose to follow the outlet creek from MacLennan Lake (Ric’s Route #22) to see if we could make our way down this normally small and rocky outlet. 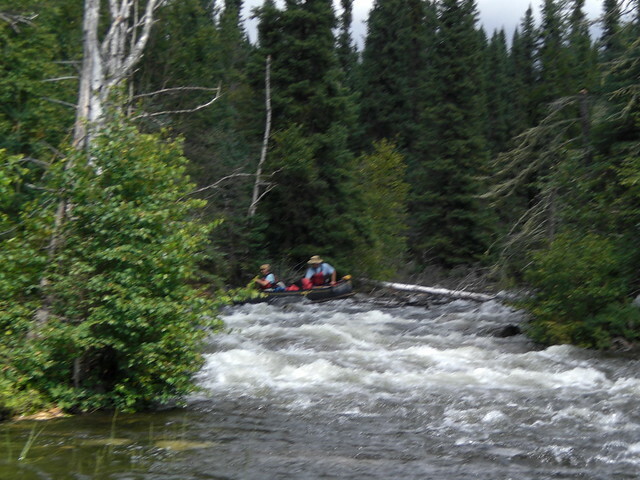 We pushed our way over the first beaver dam/rock bar, then paddled down to where a more serious drop started. One boat chose to portage this section on a 50 metre trail on river left into a small nameless lake. The other boat chose to walk part way down this drop then, after much positioning and attempts to get the stern paddler back into the boat, ran this drop with no misadventures. We had lunch on the shore of this lake and then both boats ran a fun, straight and narrow shoot into Davis Lake. This was a very high water year in this area and this option would not be possible in most years. We paddled down Davis Lake seeking shelter along the west shore from a headwind then portaged a 100 metre portage into Minuhik Lake. This portage is much used and is in good condition. We camped on a small island (Grid Reference 364865 – four tent sites) a few hundred metres into Minuhik Lake. It’s a nice spot but starting to show signs of wear. Fearnside Lake is a very pretty narrow lake with high rocky sides. There are possible campsites, but few signs of visitors. Since it was early in the day, we didn’t stay on Fearnside. From Fearnside through Stauffer and on to Ducker Lake the route is on a creek which has grassy meandering sections connecting narrow, rock garden drops. It is a pretty valley, with high ground to the sides and occasional rock outcrops and cliffs. There are also some beaver dams in shallow rocky spots, which can be dragged over. This section shows very few signs of use. The drops are narrow, bony and often completely blocked by deadfall. All have decent portage trails, clearly made for/by past canoe travelers. Running the drops is not recommended. Always scout first – something that I keep learning and re-learning. The start of the portage on Fearnside Lake end is RL beside the beaver dam/rock bar. (G.R.366758). 200 meters This portage bypasses a shallow rocky drop in the creek which is blocked by deadfall. The S landing is along the outlet creek in the reeds just below the swift water of the rapid. The trail is rarely used but nicely laid out. We removed a lot of deadfall, including a tangle in the water at the Fearnside landing. The route then meanders with the grassy creek for more than a kilometer, ending in a pond blocked by a low rock wall. Here, the creek drops 3 meters over a rock ledge, then cascades down a narrow chute for the next kilometer. A 15 year old burn on the west and south adds to the tangle of deadfall. There is a portage trail (start of portage is at G.R.360746) but when we arrived here and considered our options since the trail was blocked by a number of fallen trees and was beginning to grow in, it did not seem our best option at that time. The portage bypasses the narrow, rocky, steep cascade and ends in a swampy pond. It is about 300 meters long. The Upper landing is on dry grassy bank on RL above the drop/beaver dam. Trail is nicely located, but rarely used. It enters an old burn part way along. It is somewhat brushy. The lower landing is in floating sedge, and is not obvious from the water (we flagged it). There was a lot of big deadfall blocking this trail, which we removed, including a very big spruce tree which had been uprooted and fallen the length of the trail in the wet ground at the S end. We had adventures on this bit. We considered our options to get through this section. We looked over the ledge at the top, decided that the initial drop by the ledge/beaver dam was all or most of the drop (we did this without consulting our maps???) and decided to lift over, lower the boats and gear down about a 4 meter steeply inclined rock face and try to line/run the creek which appeared to be quite mild at this point. This was a mistake. It started well with mildly moving water, some width to the creek and not much of a drop. It soon changed as the drop increased, willows and alders formed a tunnel over the narrowing channel and sharp granite rocks appeared with alarming frequency. The first boat down found that there was no room to manoeuvre and not enough water to back-paddle to slow down. Eventually we went aground on some rocks and immediately whistled to warn the second boat not to come down. At least we were stopped but what to do? We were able to get out of the boat and guide it to a more secure location. It seemed at the time that the only course of action was to wade/line the boat down the rocky waterslide, after all, how long could it last – surely not long? One of the members of the other boat walked through the tangled growth along the shore and viewed our activities. They decided that they would not join in the fun (remember The Injury?) so they elected to struggle through the deadfall up to the portage trail. While one boat was slowly working it’s way down the cascade, the other boat and gear was being portaged through the deadfall about a hundred meters to the trail. Back to the floating boat – the creek did go on for several hundred more meters with one eventful drop after another. These were successfully negotiated with a few moments of tension when the boat got away and turned sideways and another when the boat slipped quickly down a drop and ejected a day pack. The day pack was recovered some while later with only some wet clothing to pay for our carelessness. The camera was OK! Eventually the drop stopped and we paddled a slow, meandering stream to within 30 meters of the swampy pond (the end point for the portage). We were able to force our way through a very narrow stream in the floating sedge up into the swampy pond. At this time we had no idea where the other people were or exactly what they were doing. We paddled across the swampy pond and picked a likely looking spot to land. We then spread out the wet items and started through the tangled deadfall of the old burn to find our friends. For those of you who have tried to walk through an old burn, you know that this was an adventure. After we had been walking, balancing and struggling through this mess, we heard the comforting sound of a chainsaw. We worked our way toward that sound and found the trail and then our friends. It seemed only logical, since we were here and had to clear the trail so our friends could get through, to do a good job on the trail. This took quite a while due to all of the deadfall and the in-growing alders and birch. A few hours and much labour later we completed our work and our friends, their canoe and gear were down by the floating sedge on the bank of the swampy pond. Unfortunately, the portage trail did not end where we had parked our canoe so I had to go through the burn to find our boat and bring it back to the end of the portage. This was finally accomplished and the second boat was finally loaded and we set off across the swampy pond. At the south end of this pond we had to force our way through the very narrow channel through the floating sedge and into the meandering stream. We paddled on toward Stauffer Lake but had one more beaver dam to paddle and push over before we got there. Next time through here we will take the much improved portage trail and save a lot of time and effort. It was now late in the afternoon. The north end of Stauffer Lake had been burned and offered no campsites. We were tired. As we paddled down the lake we explored any place that looked like it might offer a campsite but with no success. Finally we found a small island (G.R.332731), 1+ tent site. part way down the lake which had not been burned. Though far from ideal, it offered two tight campsites on the very top of the island and a good kitchen area. We stopped. The next day we discovered that there is a better campsite on a small island further S (G.R.321723), though it was trashy with abandoned clothes and cans. There is a cabin on the north side facing the outlet bay. (G.R.323717). After a good night’s sleep and a hearty breakfast we went to where the small outlet stream left Stauffer Lake. We looked over the portage and thought that we would check to see if there was a portage from the southwestern bay of Stauffer Lake to the creek below the rapids. We could not find one in the most logical place despite an extensive search. Evidently there is a portage that leaves the extreme southern tip of this bay that meets the creek some distance below the falls. We did not see this trail. We went back to the outlet stream and started the portage. (G.R.318710). 300 meters. Upper landing is on grassy bank RL just below beaver dam/rock bar at lake outlet. Drag canoes over the dam/bar, then paddle across the slack water to the landing. This allows access to a pretty trail along a rocky ridge. The start of the trail is fairly steeply uphill but it levels out after that. Lower landing is in the reeds just below the swift water. Trail showed very little signs of use, but was beautifully laid out and in good shape. No clearing was required, though the trail is a bit brushy. 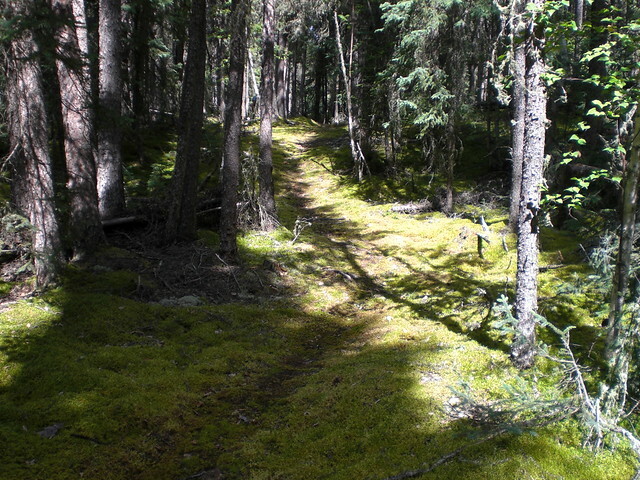 This was clearly a canoe portage, as it is too narrow for boats and follows a narrow flat along a steeply sloping rocky ridge – too much side hill for skidoos. We scouted this rapid. (learning at last?) It was not too steep, but it was blocked by a lot of big deadfall. After this portage, the route continues on down the meandering grassy creek. At about GR 310705 we encountered a beaver dam at the top of a rocky drop. There is a little used but passable portage trail on RL. After walking the trail and scouting the rapid , we chose to wade our canoes down the rapid as it was not as steep as most of the others and it was not blocked by deadfall. The rapid was rather rocky especially at the lower end but we were able to successfully get through. 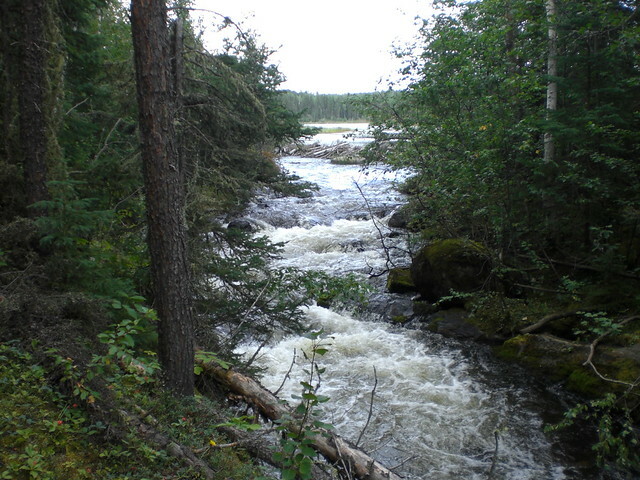 The slow meandering stream continues with 3 beaver dams/rock bars to drag over and then it enters a small nameless lake. We crossed this lake and came to a portage around a series of cascades. (G.R.295687). 400 meters. This portage bypasses steep narrow cascades blocked by deadfall. Upper landing is RR at the right hand end of the beaver dam. It goes fairly steeply up, then gradually down. Lower landing is on steep grassy bank in the grass and reeds just below the swift water. Good condition, moderately used, no clearing required. We were now in a grassy bay of Ducker Lake. After dragging over a beaver dam at the narrows we were in the main part of Ducker Lake. We camped at the lovely site beside the inlet falls from French Lake. Heavily used but clean campsite with room for lots of tents. There are several other good campsites on Ducker Lake. The far end of the campsite connects to the portage into French Lake. (G.R.280680). 70 meters. Ducker Lake landing in small bay south of campsite and falls. French Lake landing RR just above swift water which goes over falls (don’t miss the landing!). Heavily used portage in good shape. After a bit of a strain paddling up a narrows against some current, we were out into French Lake. It is another pretty lake with rocky narrows, points and islands. Many camping possibilities. We proceeded down French Lake to the portage into Grandmother’s Bay of Otter Lake. (G.R.220641). 450 meters. French landing in grassy west end of Mason Bay. Grandmother Bay landing in grassy northeast end of Grandmother Bay. Trail in good condition, heavily used, muddy in spots. We removed one large fallen tree. Grandmother Bay/Otter Lake: across the Bay, through Grandmother Narrows, across Otter Lake and on to Missinipe! A very nice trip with some adventure! Last edited by Ralph on August 31st, 2011, 2:41 pm, edited 1 time in total. Your timing Ralph is fantastic. We are (maybe) travelling that area for 5 days a week from now. This trip will be under consideration, though I'll have to wait at least a few hours to read the report.